Home Porsche Driver’s Selection Porsche model cars are popular collectors' items. The Cayenne: models of the much-loved Porsche SUV. The Cayenne: models of the much-loved Porsche SUV. The Cayenne models represent another successful development in the history of Porsche. The spacious SUV, which was first launched in 2002, has proved to be a major worldwide success. It has impressive interior and exterior features and is the perfect example of a premium class SUV. Its popularity is reflected in its sales figures. In 2013, the 500,000th vehicle left the production line in Leipzig. 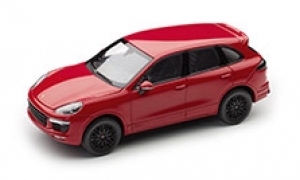 As the "big brother" of the Macan, the Cayenne models make the perfect addition to any collection.